On August 19th, 1991, the motorcade of a Lubavitcher Hassidic rebbe was traveling through Brooklyn. While driving through the Crown Heights neighborhood, at 8:20pm, one car in the motorcade drove up on the curb suddenly, the car striking and killing seven year old Gavin Cato and also leaving his older cousin with a broken arm. Word quickly spread that a black child had been killed by a Jewish motorist. Some witnesses even said the driver appeared to be intoxicated. Three hours later and five blocks away from the site of the crash, a visiting Hasidic history professor from Australia was stabbed, dying at the hospital some hours later. * Same night, 11:30pm -- visiting Hasidic Jew professor Yankel Rosenbaum, with no connection to the death of Gavin Cato, is stabbed five blocks away from crash site. * August 20th, 2am -- Rosenbaum dies at the hospital from his stab wounds; later that day, Trinidad-American teen Lemrick Nelson, Jr. is arrested in connection with the stabbing. By August 21st, he is charged with second degree murder (but by October 1992 is acquitted). * August 21st -- funeral of Yankel Rosenbaum; that same day marks the start of days of rioting and looting throughout the Crown Heights community. That first day, 16 arrests and 20 police officers left injured. * August 22nd -- the arrest count during the riots rises to 107, the police presence increased to over 1500 officers. * August 24th -- 1500 protesters led by Rev. Al Sharpton and Alton Maddox march through the streets of Crown Heights. *August 26th -- funeral of Gavin Cato; Rev. Al Sharpton delivers the eulogy. * Violent acts and courtroom drama in connection with the deaths of Cato and Rosenbaum continue back and forth between the black and Jewish communities through 1992 and 1993, both sides wanting justice and vengeance. 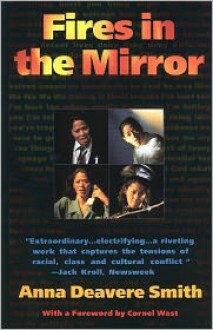 In 1993, Anna Deavere Smith crafted a one woman stage play depicting these events, compiled from the numerous interviews she did with more than two dozen Crown Heights community members, representing both sides of the story, as well as the impressions of high profile members of the black community such as Rev. Al Sharpton and writer Nzotake Shange. Smith pulls from the interview transcripts verbatim to create the monologues for the stage show, ending on the words of Carmel Cato, Gavin Cato's father. The early portions of the play explore the political and emotional environment that existed prior to the events of August 1991, while the later monologues get more into the course of events on August 19th itself (I was surprised to see the text here included one of the actual crime scene photos under one of the passages). Smith, in her foreword, writes of how it was difficult to get a clear, unbiased look of the events at the time when there was media bias from nearly every angle. It was her hope and goal to use the interviews, and later the play, to give a more honest, balanced display of this tragic and emotionally charged time. Also, prior to the start of each monologue, Smith gives contextual history such as when / where each interview took place, even what the person was wearing. For example, in regards to the use of the interview with rapper Big Mo, Smith notes that the interview used in the text was actually one done in 1989. "Fires In The Mirror is part of a series of theater (or performance) pieces called On the Road: A Search for American Character, which I create by interviewing people and later performing them using their own words. My goal has been to find American character in the ways that people speak... my goal was to create an atmosphere in which the interviewee would experience his / her own authorship. Speaking teaches us what our natural "literature" is. In fact, everyone, in a given amount of time, will say something that is like poetry." While I appreciate Smith's unique approach to the subject matter, I'm not sure it entirely worked for me, personally. I was expecting for these passages to be more impactful. While some of them are quite good, there are others here where I was wondering about the relevance. The words themselves always didn't quite hit the mark for me, so I did a watch of the stage show itself. While better, even there something was falling short. Again, I can appreciate and acknowledge the work that clearly went into crafting this show, but the execution ... something was a little off for me. It didn't always strike me as unbiased a portrayal as Smith claimed she was aiming for and some of the acting did come off as at least a little bit too caricatur-ish. Sheila Ingle’s husband John was brought up in Ingle Holler in Union, South Carolina, with eight other Ingle families. They worked together in the mills, shared their gardens, attended church, and enjoyed the playing and singing of the songs from the Grand Ole Opry. When five of the brothers went off to war, those who couldn’t fight took care of their families. The Ingles stuck together, just like they were taught in the Appalachian hills of Erwin, Tennessee. Love of God, love of family, and love of country were modeled in each home. In fact, one year Make Ingle put his sons and grandsons together to build Hillside Baptist Church. Adults kept up with the newspapers and the radios; world happenings were important. Any type of sickness brought a barrage of soup and cornbread, because children still had to eat. On those twenty acres, the children played in the creek, cowboys and Indians, and hide-and-seek. They built their own wagons and sleds to race down the hill on the dry, hickory leaves. All the boys learned to shoot a .22 caliber, and John’s mother Lois could light a match with her shots. Living in Ingle Holler was home, where each one was accepted. Sometimes it was difficult to remember back to those early years 37 years ago. The skinny auburn-haired girl, afraid of the dark and her own shadow, had matured into a woman who was a right good spinner and fit as a fiddle. Her third grade education had not held her back. Though considered one continuous non-fiction piece, the chapters are set up to showcase one particular member of the Ingle family (per chapter) and a story unique to them. But the stories are so moving, so richly infused with life & spirit, the reader quickly gets immersed in the lives of these people long gone. 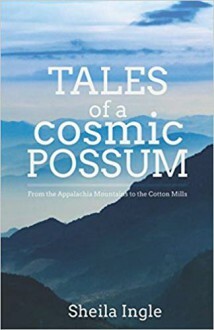 Sheila Ingle's writing is so inviting, offers such a sense of inclusion to readers, that this work of biography moves more like a collection of interconnected short stories. I guess, in a sense, they are! The very last chapter focuses on Sheila Ingle's mother-in-law. Relevant black and white photos are included in some of the chapters to enhance the scenes described. There are also several pages of additional photos of family members at the back of the book. Collectively, the chapters span the years between early 1900s - 1950s, chapters full of heartwarming stories of neighbor helping neighbor, even when it seems like you have nothing to offer. Sheila Ingle, through the stories of her husband's family, illustrates that though one may have meager physical possessions on hand, you may be surprised to realize that, in fact, there is nearly always something within your ability or means that can be of use to someone in need. These are the types of books we need more of in this day and age! *Note to animal lovers though: Early on in the book, during Fannie's story, there is description of Fannie witnessing the hanging -- literal hanging -- execution of a circus elephant who trampled its handler to death after being startled. The imagery, as you can imagine, is pretty disturbing. FTC Disclaimer: Ambassador International kindly provided me with a complimentary copy of this book in exchange for an honest review. The opinions above are entirely my own. Bob Woodward exposes one of the final pieces of the Richard Nixon puzzle in his new book The Last of the President’s Men. Woodward reveals the untold story of Alexander Butterfield, the Nixon aide who disclosed the secret White House taping system that changed history and led to Nixon’s resignation. In forty-six hours of interviews with Butterfield, supported by thousands of documents, many of them original and not in the presidential archives and libraries, Woodward has uncovered new dimensions of Nixon’s secrets, obsessions and deceptions. The Last of the President’s Men could not be more timely and relevant as voters question how much do we know about those who are now seeking the presidency in 2016—what really drives them, how do they really make decisions, who do they surround themselves with, and what are their true political and personal values? Butterfield's role was the outsider turned insider that never felt like or was treated as a true insider. Maybe that's why he had no problem throwing down the most important piece in the Watergate investigation - the fact that there was a recording system in the Oval Office. Butterfield didn't have the loyalty to the Republican party or Nixon specifically, so when asked the right question, he had no qualms about spilling all the knowledge about the tapes. This is Butterfield's story, starting from his time as the military aide to the US ambassador in Australia wanting to get back to Vietnam to command an USAF wing or to go to the Pentagon/White House as a military advisor. Unfortunately Alexander Haig got the ear of Haldeman first, so Haig was named as military advisor; however, Haldeman had another role for Butterfield to fill and Butterfield accepted the position and retired from the military to be a White House aide, directly working for Haldeman and Nixon. It was Butterfield's task with getting the recording system in place via the CIA IT department. Butterfield had no love for Nixon then or now. Nixon was an awkward, rude, paranoid, emotionally unstable man-child and was out for vengeance against anyone who ever slighted him. Butterfield's discussion of the Nixon marriage was something new to me, but seems right in line with Nixon's relationship with anyone. Poor Pat Nixon, being married to a guy who had no problem neglecting her/emotionally passive-aggressive on a daily basis. There was only a slight mention of Spiro Agnew and that was when Agnew was banished to the far side of office buildings as per Nixon's direct orders....the relationship between president and vice-president was almost non-existent. Nixon's relationship with Henry Kissinger on the other hand got several (short) chapters. 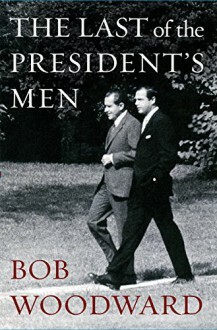 There is also an account of Nixon making an awkward intimate pass on a White House secretary while traveling from Camp David to the White House - it made me cringe that if not directly a MeToo moment, was certainly uncomfortable for all those involved. After four years, Butterfield wanted out and went to FAA. He was not part of the Watergate break-in or cover-up, but his spilling the recording system secret made him part of the investigation. After all was said and done, Butterfield was shunned by most Republicans, including Gerald Ford, who went looking for a way/reason to boot Butterfield from the FAA. This was a quick read and a shorter than meets the eye due to an appendix of nothing but White House documents from Butterfield's time. These documents were explained in the text, but don't add anything that the reader couldn't get from the text. The documents do add another 50 pages to the book - that's it. I do think this book is needed in the Watergate library as a rebuttal to the biographies of Haldeman, Kissinger, and Nixon. 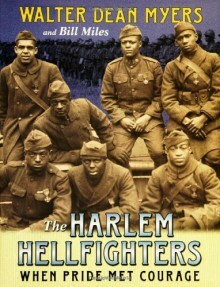 I was not aware of this part of early 20th century American history until I saw a couple of people reading this book. Looking at the list of people in the book was a bit daunting, but you can easily keep them straight in your head while reading the book. The descriptions of the women's maladies were handled with sensitivity and not too graphic. I like that Ms. Moore added the environment cost associated with the businesses. I think parts of this book (specifically the parts about the lawsuits/verdicts and how they played into the bigger labor movement) should be taught in high schools. 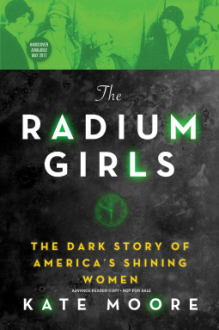 https://en.wikipedia.org/wiki/United_States_Radium_Corporation is one but the one in Illinois is not. This short, shallow look at the African-American US Army unit that fought in the trenches of France in WWI wasn't enough. First, the writing was pure US Army - that is, written at a 6th grade level (and that is not a dig at soldiers - all military writing is written at 6th-8th grade reading level to ensure everyone can/should understand). There was a lot more history of African-Americans serving in the military since the days of French and Indian wars through the Spanish-American war. Yet there were hardly any profiles done on the men who made up the Hellfighters; I learned more about the white officers in charge than the men who actually fought. There was very little detail, but a lot of fluff about how courageous they were and vague mentions of valor. I needed more than what was offered and felt the enlisted men of the unit deserved better writing on their achievements.